Powers/Abilities: Though a slave-girl, Hidilco had enough wits to feign anguish to hide her true intent, and to hurl an amulet across the room to knock another object from a man's hands. (Conan the Barbarian I#30 (fb) - BTS) - Munthassem Khan, the satrap of Yaralet, was driven to cruel madness by the Hand of Nergal. He had all wizards of Yaralet slain, but he allowed the philosopher Atalis to survive. However, he cursed Atalis with fits of agony. In addition, Munthassem Khan cause Prince Thann to develop fits of blindness. (Conan the Barbarian I#30 (fb) - BTS) - Atalis joined forces with Thann and sent their Brythunian slave-woman, Hidilco, to recruit the aid of the Cimmerian barbarian Conan who had recently acquired the Heart of Tammuz, the counter-talisman to the Hand of Nergal, though it could be best wielded in the hands of a woman. Hidilco sought out Conan and was incapacitated by the Devil-Beasts of Nergal, whom Conan unwittingly drove off with the Heart of Tammuz. 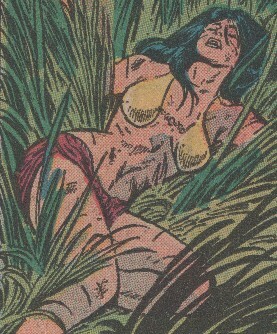 (Conan the Barbarian I#30) - Conan found Hililco unconscious in the grasses. After he introduced himself, Hidilco told him that her master was seeking him out and that he would be paid much gold if he followed her to his house. After they arrived, Atalis told Conan of Munthassem Khan and the Hand of Nergal, and also shared that Conan's new possession was the Heart of Tammuz, which was the Hand's counter-talisman. Atalis led Conan and Thann into Munthassem Khan's chamber, intending to ambush the still-drugged Munthassem, but Munthassem suddenly awoke, announcing that he had been expecting them (he had sensed Atalis peering at him through his mystic crystal). Munthassem Khan swiftly dropped Atalis and Thann with their fits of pain and blindness. Conan rushed to the attack, but as he knew not how to invoke the Heart of Tammuz' power, Munthassem Khan struck him down as well. Hidilco then rushed in, seemingly in anguish over Conan's injury, but she suddenly grabbed the Heart of Tammuz and hurled it across the room, knocking the Hand of Nergal from Munthassem Khan's clutches. A darkly shimmering glow spread from the Hand of Nergal, which unleashed the form of Nergal itself, while the Heart of Tammuz released the form of Tammuz. Tammuz banished Nergal, and both the Heart and Hand vanished. Munthassem Khan was gone, as well, leaving behind only a handful of smoldering ashes. Atalis noted that the Heart was ever stronger than the Hand. Conan declined a chestful of gold, instead taking a smaller sack of gold and a good strong horse. He then grabbed Hidilco and took off with her. Comments: Created by Lin Carter and Robert E. Howard. 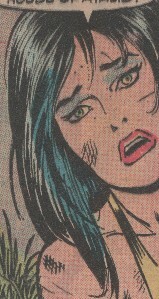 I can't get to my comics just yet, so someone will have to tell me if Hidilco is in Conan the Barbarian I#31. If so, I'll add it...maybe next weekend.